Ask anyone who has ever seen Ramsay Bolton in Game of Thrones —witnessing a Bolton "hunt" is rarely a good sign. So too is the case for the supernatural Wild Hunt of European myth. A phenomenon believed to resemble ghostly knights or hunters chasing the clouds across the sky, the Wild Hunt has long been considered a symbol of impending doom. The tale of the Wild Hunt predominately comes down through literature and "eye witness accounts" in the British Isles and Northern Europe, two cultures who very strongly value the tales of elves, faeries, and gods. However, the case of the Wild Hunt is a little different: it is thought that the apparition of the hunters is a symbol of the Anglo-Saxon or Norse god, Woden/Odin (respectively), a deity often associated with warfare and the sky. Just as in other myths regarding omens of catastrophe and threats, seeing the Hunt is believed to precede a manmade or natural calamity, generally a war, plague or famine, or—as seen with the Banshee of Irish folklore—the death of the person unfortunate enough to witness the Hunt in action. What is interesting when examining the Wild Hunt in depth is that the event itself is not a remnant of a pre-Christian myth that has come down through the ages. 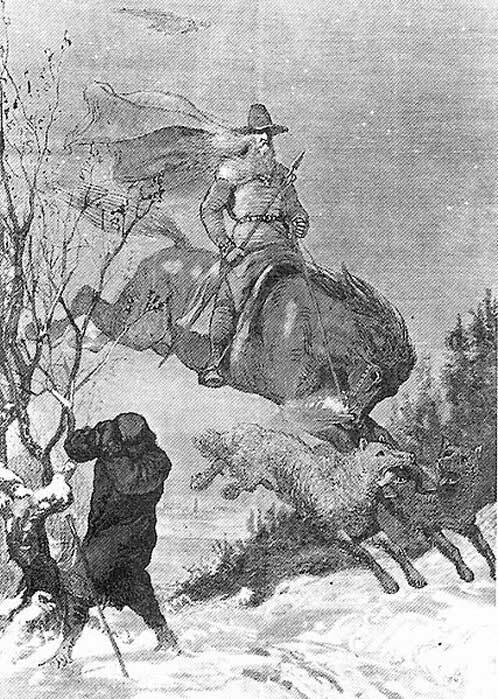 In actuality, the concept of the Wild Hunt is itself somewhat "manmade", as it was first documented as a mythological or folkloric trend by Jacob Grimm. Jacob and his brother Wilhelm are remembered for collecting numerous German (and some non-German) fairytales into one codex; yet these brothers—Jacob in particular—did more than merely collect such stories. They investigated the fundamental roots of them. The phenomenon of the Wild Hunt is the product of one such investigation. ...they sweep through forest and air in whole companies with a horrible din. This is the widely spread legend of the furious host, the furious hunt, which is of high antiquity, and interweaves itself, now with gods, and now with heroes. Look where you will, it betrays its connexion with heathenism." 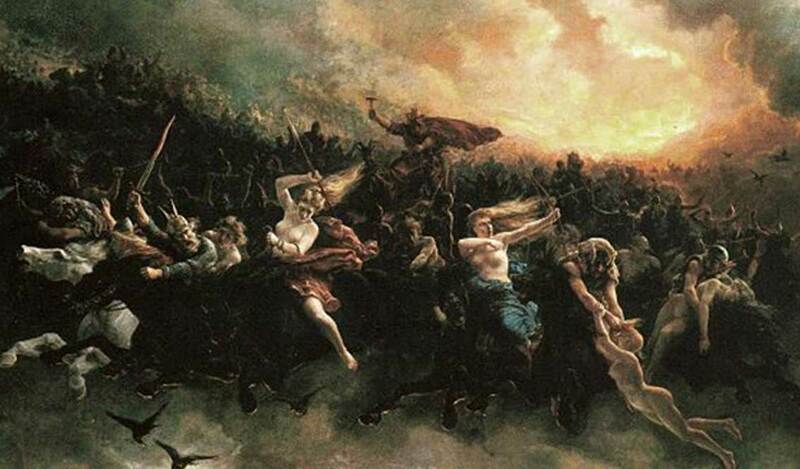 The Wild Hunt somewhat appears to mirror the descent of Odin's Valkyries from the Halls of Valhalla to the various battlegrounds upon which the Norse warriors fought. In Norse myth, these Valkyries were tasked with plucking the noblest and strongest of the dead or dying from the fields and carrying them back to Valhalla to heal and train, and await the final battle of Ragnarök. As Jacob Grimm describes the Wild Hunt—both as an event and a concept—a similar situation occurs. Kveldulf Hagen Gundarsson states in his poem "Mountain Thunder", "But then the barking of dogs fills the air, and the host of wild souls sweeps down, fire flashing from the eyes of the black hounds and the hooves of the black horses ." The "host of wild souls" sounds quite familiar. In fact, Gundarsson's poem is suspected to have drawn from a Norse myth loosely called "Odin's Chase", in which the titular god becomes the leader of a ghost army. Variations of this tale abound, most significantly in Wales, in which a man (sometimes considered of the Faer Folk) called Gwynn ap Nudd takes on the role of leader of the dead, and in the south of England, where Herne the Hunter takes on the role. Herne has been considered both a pre-Christian forest deity or a mythical version of a king called Herla. Regardless of the name and species however, once again the core elements of the Wild Hunt remain intact. One might wonder why such analysis is significant. A myth about ghostly hunters swarming the sky could just be an old-wives' tale or a much bastardized historical account of an actual event. More likely, also argued by Jacob Grimm, the numerous variations of tale of the Wild Hunt—as is the case with most folklore—are attempts by early cultures to explain natural phenomena and any consequences that resulted from these occurrences. In the case of the Wild Hunt, the most argued natural occurrence is a thunderstorm. The formless, swirling shapes of the deceased warriors engaging in a race against time as they stalk their prey on the backs of thundering horses… Or, thick, dark clouds rolling in from the horizon, lightning punctuating each drumroll of thunder as Nature prepares to devastate the unsuspecting. The Wild Hunt, therefore, is as much a mythical chase as it is an allegory to explain drastic—and unpreventable—shifts in weather. The unmistakable comparison to the pre-Christian Norse belief that the Valkyries descended from Valhalla on furious wolves makes it evident that the European tale of the Wild Hunt likely stems from this myth. Ongoing strife between the Anglo-Saxon forces in medieval England and the pre- and post-Christian Vikings furthers this suggestion. Frankly, it is far more interesting to consider every thunderstorm an onslaught of ghostly warriors caught in a vibrant, bloodthirsty chase (or even of the Valkyries searching for the noblest of fallen warriors) than the scientific explanation. Banks, MM. 1944. "The Wild Hunt." Folklore 55.1. p. 42. Grimm, Jacob. 1883. Teutonic Mythology: Vol. III . (trans. James Steven Stallybrass, 2004). Mineola: Dover. Motz, Lotte. 1984. "The Winter Goddess: Percht, Holda, and Related Figures." Folklore 95.2 p. 151-166. Similar in spirit and lore as described in the article above. The wild hunt is also known in France, under different names, like "Mesnie Hellequin", "chasse fantastique", "chasse Artus", etc. Its origins are germanic for some authors, celtics for other (an avatar of Cernunnos). "... In the case of the Wild Hunt, the most argued natural occurrence is a thunderstorm. ..."
Even more fundamental for explaining the Wild Hunt is the changing of the seasons: from the - larger -summer season to the - larger - winter season. This started in the old days on the first full or new moon after the september equinox. This larger winter season was the season of darkness, cold, mystery, death, underworld and so on. The idea was that in this season the gods of the underworld were nearby and visited the human world. This was a necessity because fertility itself was believed to originate from the underworld. One of the rituals that you find throughout Europe and beyond is the blackening of the face as a sign of reversal of the seasons and life and death. Last summer, one evening me and my girlfriend watched the clouds for hours until sunset. It has been several days with thunder and showers and heavy winds, but now the weather had calmed down. You could see several long cloud formations stretching all over the horizon, but it was light colored sky above and under the clouds. The clouds itself were dark and rugged and had holes in it. They were not rolling in as in you were thinking off, but floating away. Thunderclouds rolling in look more like mountains of stacked clouds. After the storm they look more battered! We saw them rapidly change shape caused by the strong wind that chased them away, and with not too much fantasy you could recognize giants, dwarfs, man with weapons, horses, dogs ... and they made me think of a Wild Hunt!